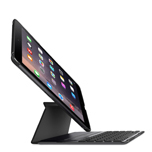 Playa Vista, Calif. – December 4 2014 – Belkin International, the market leader for tablet accessories, today announced availability of its new keyboards for the iPad Air 2, the award-winning QODE Ultimate Pro Keyboard and the QODE Ultimate Keyboard. 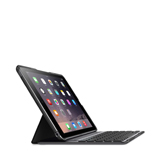 Belkin's most advanced iPad keyboards to date, both keyboards are designed specifically for the iPad Air 2 and are available exclusively at AT&T and Belkin.com. "Our newest flagship keyboard, the QODE Ultimate Pro Keyboard for iPad Air 2 combines durable tablet protection, unparalleled versatility and an upgraded typing experience in one convenient, lightweight package," said Ana Hory, the director of product management for Belkin's QODE keyboard business. 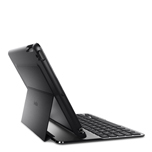 "It's a game changer in the iPad accessory market and we are thrilled to launch both new keyboards exclusively at AT&T just in time for the busy holiday season." "We are excited to be the first retailer to offer the new QODE keyboards this Holiday," said Michael Cowan, accessories business director at AT&T. "Our customers benefit from having two wonderful options – the QODE Ultimate Pro keyboard and the QODE Ultimate keyboard – both of which offer style, protection, and productivity in one unified accessory." The QODE Ultimate Pro Keyboard for iPad Air 2 and QODE Ultimate Keyboard for iPad Air 2 are available now at ATT.com and Belkin.com, and will be available in AT&T Stores on December 6. Belkin makes people-inspired products that harness the power of technology to enrich people's lives. To learn more, visit us on the Web, like us on Facebook, or follow us on Twitter. Apple and iPad are trademarks of Apple Inc., registered in the U.S. and other countries. iPad Air is a trademark of Apple Inc.